Fabric Codes for Cleaning: What Do They Mean? Once you decided which sofa style you want to buy, it’s time to choose the perfect upholstery or slipcover fabric. Color, pattern and texture are certainly important, but there is another factor that should be part of your decision: the fabric care code. Why is the fabric care code such a big deal? Well, it provides the guidelines for how to clean your fabric. If you end up spilling something on your new sofa, spraying it with foaming upholstery cleaner from the store may just make matters worse. Know your fabric’s cleaning code and you can have the correct cleaning products on hand (meaning you can act quickly if something spills). O (Organic Fabrics) For spot cleaning, use an eco-friendly cleaner. For overall cleaning, if your slipcover is washable, wash in cold water with a biodegradable detergent or eco-friendly soap. Organic dry cleaning is also recommended. W Spot clean with water-based shampoo or foam upholstery cleaner. Do not use solvents to spot-clean. S Spot clean with a water-free dry cleaning solvent. Do not saturate. Do not use water. X Clean only by vacuuming or light brushing with a non-metallic stiff brush. Do not use any water or solvent-based cleaner. If your whole sofa is dirty, consult a professional upholstery cleaning service. Don’t be tempted to do it yourself—even if cushion covers have zippers! All fabrics shrink, even if dry cleaned, and the cushion cover on an upholstered piece will usually not go back on after it’s been cleaned. 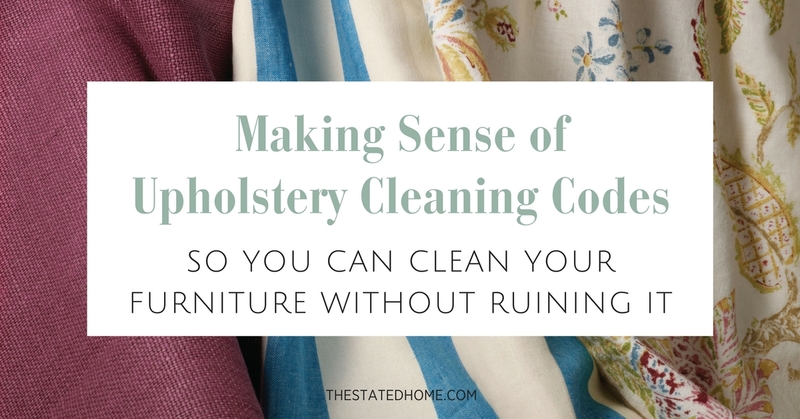 If you want to be able to take your cushion covers off for cleaning, then choose a slipcovered piece. At The Stated Home, we tell you exactly how to care for your upholstered furniture’s fabric when you look at the swatch online. When in doubt, contact us to confirm what to do. If you buy furniture from somewhere other than The Stated Home, ask the retailer for the code so you know. For guidelines on general upholstery care, please see this article.